The pace of human advancement is increasing exponentially. Most human beings who have ever lived have not enjoyed what we would today consider the most basic of freedoms. The vast majority of human beings that have EVER lived have NEVER been active participants in a democratic society or even in an effective economy. Democracy as we today understand it, has largely been a privilege accorded only the citizens of wealthy western nations during the past approximately hundred years. The franchise until the French and US revolutions was the privilege of only wealthy male landowners in very few societies, and was only extended to women anywhere in the twentieth century. The concept has been basically alien to the experience of every arab born to this earth and not inclined to emigrate. Over the 2.6 million years humans have existed on this planet, democracy has been a defining and significant factor for at best the last 100 of those, and even then far from universally. So using a VERY rough calculation, that's 0.038% of the human lifespan which has operated even broadly speaking under democratic conditions. In 1820, with the main economic impact of the Industrial revolution still to be realised, the vast majority of people still lived in extreme poverty, with only a very small number of social elites possessing any appreciable wealth at all. Since 1820, the human population has increased SEVENFOLD, yet measures of both absolute and relative poverty have proceeded BACKWARDS pretty much continuously over the same time. The UN's Milennium Development Goal was to HALVE the numbers living in extreme poverty by 2015. In other words in the year 2000, the aim was to HALVE the numbers of the world's extreme poor, a status that the majority of human beings have lived under for 2.6 MILLION years in just the next FIFTEEN. It sounds impossibly ambitious, but now 2015 is with us, what's been the upshot? How far short did we fall? Well, the target, you may be surprised to hear was MET, and was actually met FIVE YEARS EARLY in 2010. The absolute number of the world's extreme poor has been HALVED in the space of just ONE DECADE, and the foundations of Capitalism weren't shaken by one solitary micron in the process. Now, if the elimination of poverty is not the one core goal at the heart of socialism, then socialism possesses no goal at all. But every significant reduction we've ever seen in levels of human poverty over a sustained (better than ten year) period has taken place under capitalist regimes. Socialist systems might prevent relative inequalities within societies, but not between societies, which is why we need to look to absolute rather than relative measures of poverty to assess what has truly occurred. So, chart one highlights this most particularly if you consider there's 2.59 million years missing at the left end of the chart. But you can extrapolate those. It also highlights just how great a tipping point World War Two, or more correctly its end, has been for human advancement. We'll return to this date time and time again when we look at the historical patterns across several key metrics. It comes as no accident that historians identify the period following the second world war as a distinct and crucial "second wave" in the process of globalisation. 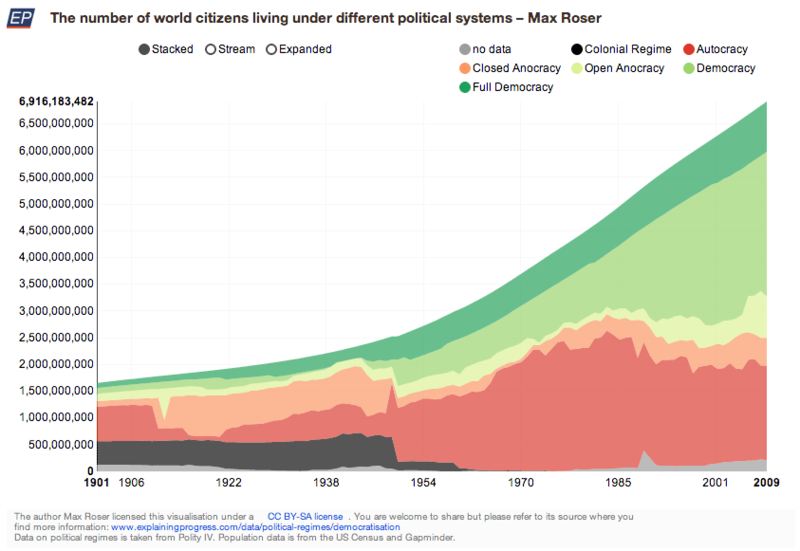 Chart one shows us that as the planet has become more globalised in its interactions, so it has become more democratic too, and at a rate that appears to coincide with this same proliferation of more globally mobile capital. Many have struggled for generations to achieve things any being on earth can now do at the touch of a button. And this has been a direct function of the exponential advancements in human science and technology that have occurred since the Enlightenment, but which we feel even now are only just beginning to escalate around us. The rate of advancement was positively glacial from the Enlightenment to the Victorian era when viewed relative to what we've achieved since, and we certainly don't have a sense this is slowing down. Average human life expectancy at birth in the Paleolithic is estimated to have been around 27-31 years. By the year 1900 it was still around just 31 years. So that's no appreciable progress in one of the core metrics of human development for the first 2.6 million years of humanity's history. By 1950, life expectancy had finally begun to rise for the first time, and has grown exponentially since. In 1950 we expected to live 48 years, come 2010 and we're now living on average over 67. And of course the average is even higher for advanced western economies. The overwhelming majority of people who have ever lived died unpleasant and by our standards premature deaths. So few old men have ever passed comfortably in their sleep. The mass of people down the ages who have passed what we would recognise as miserable and uncomfortable existences is just unfathomable, and modern socialists would rail at the injustice of every one. But after 2.6 million years of no change, we've more than doubled human life expectancy in the last 100 years, with over half of that occurring in the last 60, again accelerating at a similar pace. It appears by any rational analysis as though it took the enabling complexities of advanced global capitalism that were ushered in after World War I to achieve this, and those of the second wave of globalisation to truly accelerate it. However, by way of secondary evidence, these life expectancy tables are vastly uneven, dominated in the upper ranks by wealthy mostly western nations and in the lower conspicuously by the world's poorest. The number of sub-saharan African nations performing below par is staggering. If this is somehow a message that capitalism is failing the world, I'm missing something. A country's level of economic activity appears to directly and positively correlate with the health welfare of the nation's population. And once again, if this metric isn't at the very heart of socialist concerns, what are we even doing here? But even allowing for this relative inequality, and even lagging against outcomes in the developed world, we've still seen an enormous and significant improvement in African life expectancy over the same period, just not at the same pace. And one doesn't need to dig too deep into the development literature in explaining this. The enormous recent improvements in African health are widely regarded as a function mostly of global welfarism, as delivered via NGOs and the WHO, rather than a direct function of economic development, which in this part of the world has lagged behind the trend improvements in life expectancy. So, perhaps there is a message here about capitalism and its failings. If a globalised welfarism is driving improvements in key measures of equity in the developing world, and if it is doing that because economic development in this part of the world is structurally ill-equipped to the task (being artificially constrained by factors political, technological, environmental or structural to below global trend rates of development), and if it's the surplus wealth found in advanced western economies that is necessary to enable this welfarism, and let's not understate the contributions of Bill and Melinda Gates here by way of a mere example, what happens to our objectives as socialists if we lift our eyes to the internationalist rather than the local sphere? We are accustomed to being told that by the clock of the earth's lifetime, if it were compressed into a single day, then our existence on earth represents the final minute of that day, and our modern existence the final second. The lesson of this seems to be that the enabling dimensions of complexity can be powerful drivers for the advancement of any species, so the complexity of the human brain has enabled our development from tribal to modern society, but our exponential latter day development has seemingly been enabled by the increasingly global level of interconnetedness. It's the fact that all these brains are able to communicate, to pass information to one another, to develop systems for the retention of and access to the accumulated weight of human knowledge, that has essentially driven the formation of modernity. And it's from this point that we've witnessed our lifespans and collective welfare increase exponentially. So, if socialism's goal is human advancement, the enhanced global complexity and interconnectedness of human interactions must be a key objective towards attaining that goal. And that of course prescribes support for enhanced globalisation, and for internationalist, in contrast to regional modes of organisation. Technological advances in the twenty first century are now able to achieve global scale almost instantaneously. Immunisation programs now draw on years of accumulated research into their effective deployment. Powerful globalised organisations like NGOs have been able to deliver welfarism to the African continent in the ABSENCE of effective local governance and welfare. UNESCO has calculated that in the next 30 years more people will receive formal education than in all of human history thus far. 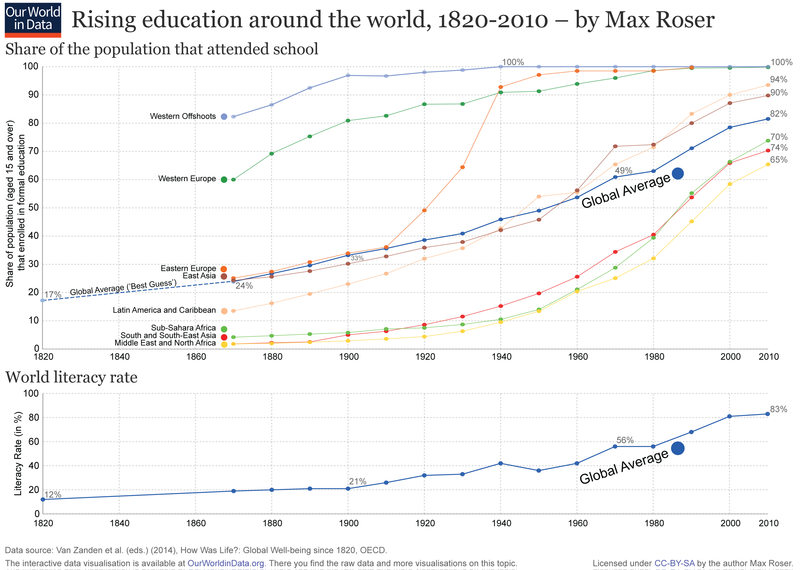 In 1870 more than 3 quarters of the world’s people never had the chance to go to school, and only 19% were literate. Let's be clear, these people are destined under capitalism to either unemployment, subsustence living, or doing capital's dirtiest, most drudgerous, dangerous and unpleasant work. The importance of education to the socialist project should barely even need mentioning. Today, in spite of the massive growth in global population since 1870, those percentages have reversed. 83% of the world's peoples are now literate, almost identical to the global school attendance rate. So capitalism has done socialism's work precisely because the needs of capital and society are not in conflict. Capitalism requires and benefits from an educated workforce, and those workers in turn benefit because the division of labor means that workers can improve their position by acquiring skills that are in relative scarcity, and thereby increase the amount they are able to charge for their labour. It's less evident here that this is being driven or much accelerated by the processes of globalisation, and that makes some intuitive sense. Where other graphs we've seen "hockey sticking" after the second world war, in line with advancing globalisation, this one offers more of a plateau. The developed world ended the war with literacy levels north of 90%, and took the next forty years to roughly attain full literacy. The developed world started from a much lower base, but has advanced particularly since the 1960s at a rate that roughly matches long run trend economic growth. The lesson here is clearly that a certain level of economic development is required in order to support a state strong enough to provide comprehensive education to all citizens, but within the span of around a single human lifetime can be transformative to the entire society. In my next post, I'll turn more specifically to the question of the potential risks and downsides to socialism under global capital. What I've presented here is the "good side" of the story, but as we've seen, unless global capital is otherwise constrained, its operation will tend to increase RELATIVE inequality within and between economies. And that should concern the capitalist set as thoroughly as it should all socialists.